Waterfront home opening to main channel! Enjoy cul-de-sac setting, with lamp post & established landscaping adding curb appeal to an all brick exterior. Master on main w/deep trey ceiling has soothing color palette & lakeviews. Dual sinks set in granite vanity, plus jetted tub, WIC & sep shower in Master BA. Cathedral ceiling & wood floors in the Foyer and GR, with stone surround FP and windows flooding the space with natural light. Neutral throughout, Formal DR adjoins kitchen with Stainless appliances & granite tops. A center island, walk in pantry & plentiful closets add great storage. The Breakfast area leads out onto a composite, low-maint deck overlooking the fenced back & water. Upper BRs, all with fans, Guest BA w/dual sinks, plus lg Bonus Rm with Walk-in closet. Dock has covered sitting area, water/electric, covered slip & new lift. 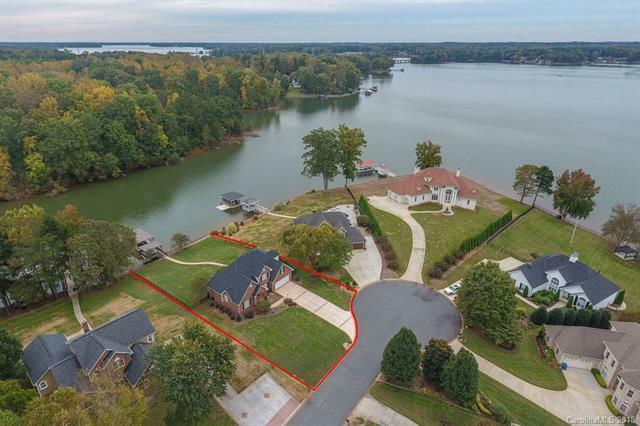 Brand new roof, central vac & lake-fed irrigation all add up to a move-in ready lake home waiting for you to make your own!